On September 8th, over 250,000 people on all 7 continents stepped up to demand tangible, real action on climate change from their elected officials. Hundreds of frontline communities led the way, building momentum and urgency for this fight. On November 8th, we kept that energy going and continued the conversation at our most recent Berkeley Climate Action Coalition Convening. Speakers from 350.org & Brown Girl Green, APEN, and OCAC reminded us that we must make the cause “irresistible,” that there are many paths forward between and within our communities, and that we already have the solutions – we just need to scale up. More than 15 groups connected with volunteers to grow their power. What we do in the Bay Area and California matters because people around the world look to us (whether we like it or not) to lead on climate change action. This is why we highlight local, justice-oriented work. It matters that we plant gardens, build bike lanes, provide safe housing to all, transition to renewable energy, and lobby in Sacramento because it all impacts our greater goal of a more safe and stable planet. Anything and everything we can do is necessary. 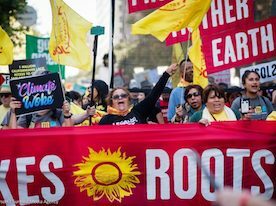 We have compiled a long list of current opportunities (as of 11/2018) for folks like you to join local climate projects, campaigns, and efforts spearheaded by established groups. No matter what your skills or resources, a lot of meaningful work is happening in the area that would benefit from your participation! The Berkeley Climate Action Coalition, facilitated by Ecology Center and the City of Berkeley, is dedicated to providing people with the resources and support they need to work on local projects towards mitigating and adapting to climate change in the East Bay. We are currently recruiting for two new Berkeley Climate Action Coalition working groups, focusing on Electrification (moving away from natural gas) and Community Choice Energy Outreach. We also have a long-standing Transportation working group you can join. Contact minna@ecologycenter.org if you are interested. This entry was posted in Blog, Climate, Featured by Minna Toloui. Bookmark the permalink. Livermore Low Carbon Program executive director is S. Julio Friedman who says we need big projects fast. He has visited all of China’s renewable energy projects. We need conversion of Livermore’s nuclear weapons program for new small tactical nuclear weapons into renewable energy projects. Also Professor Holmes Hummel at UC Berkeley is an expert in U.S. military pollution.